There are three mistakes you might be making every day at work. Whether you are managing small projects or a team of global experts, I’ve seen managers of all grades make these errors time and time again. And I’ve done it too. Susanne Madsen writes about the three mistakes that managers make in her book, The Power of Project Leadership. 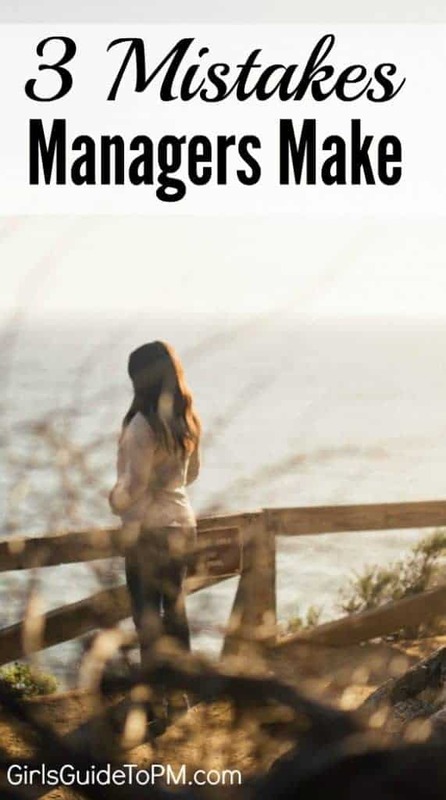 I’ve taken her headlines and added what I think they mean for managers today. Do you recognise these traits? Managing tasks and events? That’s your job, so how can it be a mistake? The management error comes when you focus on managing tasks at the expense of leading people. People get work done. Teams deliver projects. Step away from the tasks and look at the bigger picture. It’s no good having the most detailed task plan if your team are bored or stressed. Managing people should take up most of your time. In my experience people who are good at managing projects and tasks are less good at managing people. Perhaps because they don’t enjoy it as much as tweaking a project schedule. Perhaps because they don’t think it is as important. People have always been important but it’s even more acute now. Unhappy team members leave. Or worse, they stay and are disruptive and share their bad mood with everyone else. Clarifying the vision and objectives for your projects (over and over again). To move to this way of thinking we have to ditch the view that leadership and management are different. OK, they are different, but you can’t compartmentalise them in real life. They are only different when you’re reading or studying about them. In my day-to-day work I don’t ‘switch’ between being a leader and being a manager. I do them both. All the time. Whether I’m leading or managing is not a conscious choice, it’s a function of my job. I’m reactive. I deal with emails as they come in. It can be quite a stressful way to work. I’d love to have more time to be proactive but hey, it takes time to get organised enough to be proactive and time is something I don’t have much of. And I know that attitude is wrong. When we focus on what’s urgent we stop focusing on what’s important. Urgent things take up brain power that would be better used on other tasks such as getting ahead for next week or planning for that project meeting. You can be proactive. You can look at what might stop you achieving your goals, deal with those risks and look forward at supporting your team. Strategic planning cycles force us to do this, but you probably only bother to go into the details of that once a year, or when a new project needs to be prioritised against the existing portfolio. Organising a team celebration for when the project is over. Or anything else that makes you feel calm and collected inside (that doesn’t include wine and chocolate). I know a lot of things. For example, I knew that envelope neck baby gros are designed to be taken off downwards as well as over the head before that revelation did the rounds on the internet a while ago. But I didn’t know how to fold a nappy in on itself when you throw it away before another mother showed me. I don’t do either of those things at work, but the point is that you can’t know it all. As a parent or as a manager. There isn’t enough space in your head for everything. Besides, we have the internet and our colleagues and books for the things we don’t know. The important thing is to know where you can go for the information. Then you have access to knowing it all. Stop trying to prove that you know how to fix problems and do all the tasks. Use your experts to fill the gaps in your knowledge and accept that they know how to do it far better than you ever will. These three mistakes can be career-limiting. People with good interpersonal and leadership skills get promoted. Good project and task managers stay doing what they are good at (and if that’s what you want to do in life, then that’s fine – we need managers like you too!). Start shifting the way you relate to your team and ditch these unproductive habits. Read my interview with Susanne Madsen and then check out my review of her book. Well, a good manager might keep these things in mind before executing any business plan involving equal participation of his employees. But, commonly, these above mistakes happened due to either reason of their stakeholders that can be customer, employee or any other resource related to the business. One must read out the article to get detailed explanation of those mistakes that project managers always do and get to know how to avoid these or let those never happened.